One of the best things about my job is that I get to work with so many different schools, teachers and ultimately pupils. It is a real privilege being given the opportunity to share ideas, support learning and engage with young people. I’m a big fan of awe and wonder. It inspires, engages and enthuses young people so that they come to your lesson nigh on banging the door down to get in. This isn’t about creating soft learning experiences, but ones which are rich in their tapestry like a deep sauce that has been developing for years. Deeply ingrained pedagogy which oozes from every pore. I want to help make it so that pupils feel that lessons, learning and school are worth turning up for. Forget outstanding. As my good friend Lisa Jane Ashes said once, it’s about ‘outrageously good lessons’. Forget Ofsted for a minute and let’s remember why we got into this business in the first place, kind of stuff. You know? So… how do I do it? For me, as I always say, it’s about pedagogy first. So I start with the learning. Let me share with you some things I’ve been involved in recently. Earlier this month I worked at Ledbury Primary School. I had a fab time with their pupils, staff and parents. I wrote about the Computing work that I did with them <here>. My other remit at the school was to run sessions with the pupils around e-safety and digital citizenship. I didn’t want to be a “turn up, scare the kids with e-safety and then vanish like Houdini” kind of trainer. That is hollow. Empty. And leaves no legacy for the kids or the staff. What I planned involved a challenge. What I wanted to do was to have a legacy at the school. I came up with the idea of having an e-safety mascot for the school, designed by the pupils with the best ones picked out and rewarded in an assembly in my return visit a few weeks later. In Years 1-3 I did sessions which engaged children in discussions about e-safety around the lovely ‘DigiDuck’ book created by Childnet. In Years 4-5 I did a broader piece with them looking at the wider impacts of our actions online. The presentation I used with Years 4-5 is embedded below. Once I’d done the discursive pieces I then introduced the challenge. 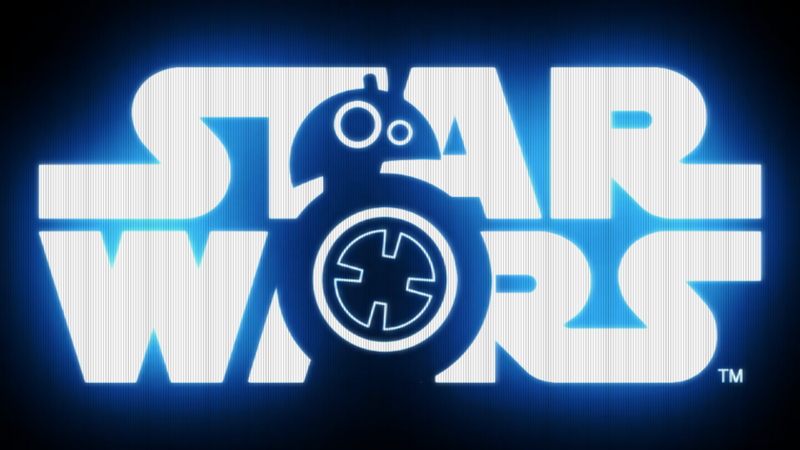 To do this, I used my BB-8. Now this little guy definitely has some wow factor about him. Not *that* well known by children yet, but he will be soon. 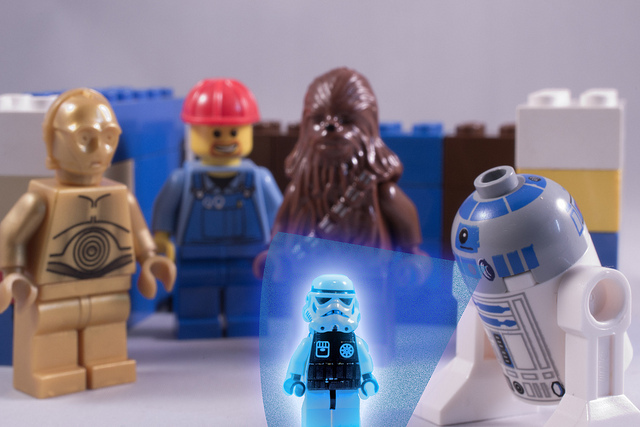 He’s the new droid in the up and coming new Star Wars film. 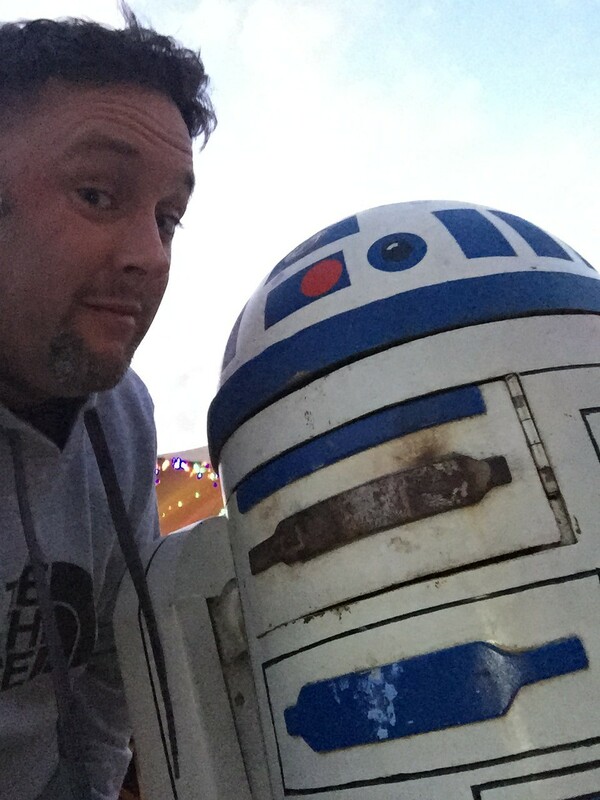 A modern day R2-D2 (see below). 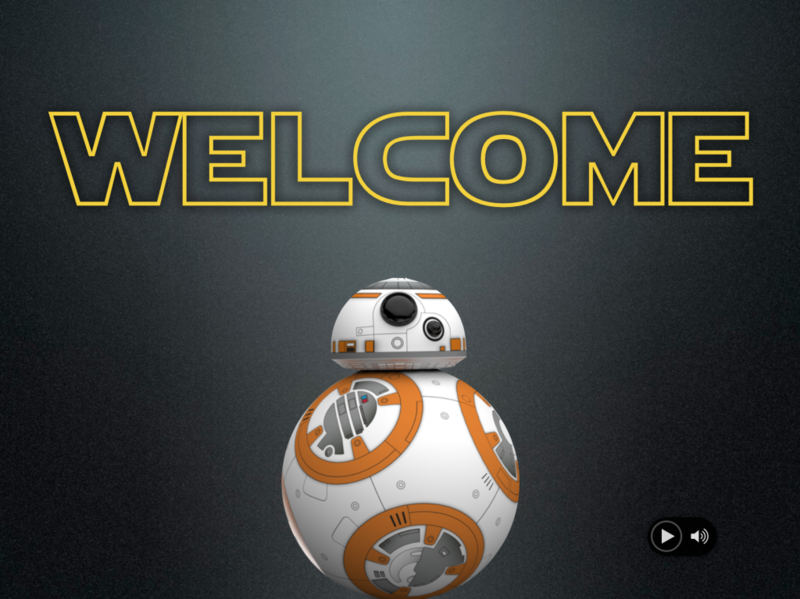 Controlled by my phone, timed perfectly to go with an animation on my keynote (hidden behind my MacBook) lid… as BB-8 moved across the screen so he then appears on the table behind my MacBook. Talk about awe and wonder. The children thought he had literally come out of my computer! Not satisfied with that kind of magic, I then moved the BB-8 onto the floor and rolled him around the children who were completely amazed and bedazzled by him! Their reaction in itself was the kind of moment that every educator lives for -truly special. At this point I then switched from my MacBook on the projector to mirroring my iPad. So what I did in the morning was, I recorded the Head Teacher, Julie Rees, introducing the e-safety challenge to the pupils. The challenge was that students had to, based upon their learning and the session I had done with them, design an e-safety mascot for their school. 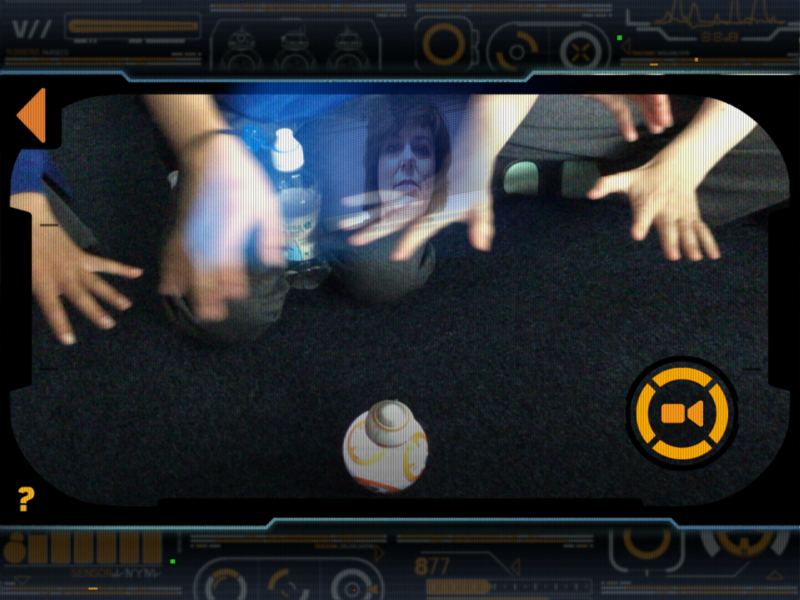 This video was recorded in the App itself and enabled the hologram of the Head Teacher to be played to the students. Oh. My. Goodness. Aside from being amazed, I was thrilled to see that the pupils were hugely fired up from this. Full of excitement and fascination. Fantastic! As mentioned in my previous post here, LPS is a values-based school, so we had spent considerable time in all of the sessions with pupils from Y1 to Y5 discussing the values an online citizen should have and how they can help keep us safe. Pupils were then able to take that thinking into designing their e-safety mascots. I know there are still some who would call this approach ‘gimmicky’. It is not. In fact it goes beyond that and very much so. If I had to choose between children being sat in rows and taught virtually in rote and having genuine authentic engagement, I’d choose the latter any day – and twice in Saturday school! Authentic engagement is a key factor to student ownership of learning. My experience tells me (backed up by ideas such as Dale’s cones of experience) that authentic and engaged learning experiences create much higher levels of motivation, desire to learn, higher outcomes and more memorable learning experiences. With this idea of authenticity but engagement through awe and wonder, I thought I’d share another example of how I’ve done this recently again. 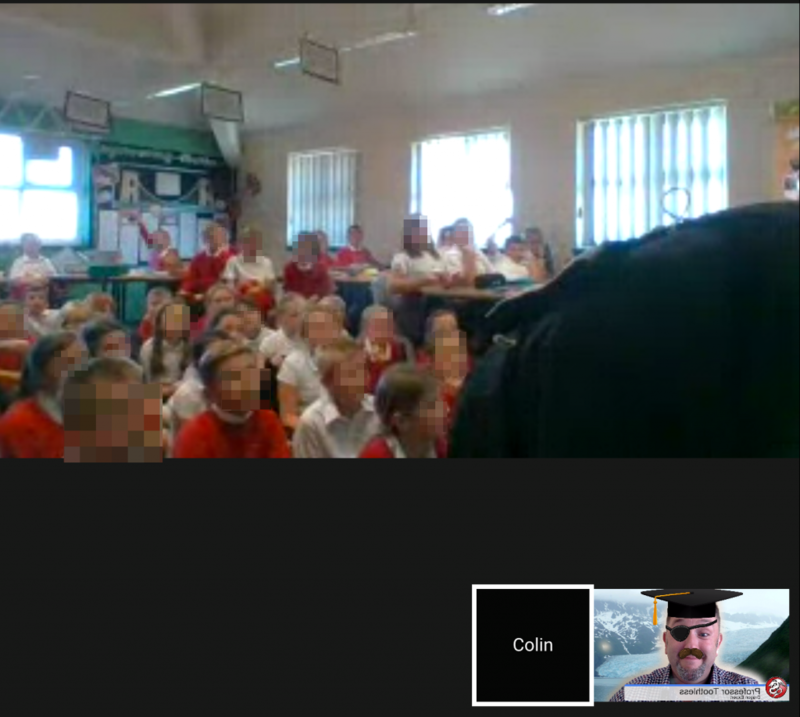 I was contacted this week by Colin Grimes aka @MrGPrimary who works at a school in the Tyneside area. Colin has been working hard with his class to improve and develop their writing. According to Colin, the children’s literacy in most aspects is good, but when it comes to writing imaginatively in their books, they find it a bit more difficult. To help with this, he’s been using Talk for Writing strategies to engage them. To hook the children into their learning, Colin took them on a Dragon Hunt. By immersing the children into a ‘real life’ learning situation, he was able to engage and excite their interest. The existence of dragons doesn’t much matter. The thrill of the hunt was enough to capture the children’s interest. Colin however decided to go one step further than this. Using Twitter, he made enquiries as to whether anyone would be willing to ‘pose’ as a Dragon Expert and talk to the children about Dragon’s. Awe and wonder! The children would have the opportunity to interview and ask questions of the expert in the field of Dragon’s to reinforce their learning. Pose as a Dragon Expert?! I accepted the challenge! Now, before I go into much detail about the event, I want to talk a little bit about how simple wins using technology can make not only your life easier but can bring about higher engagement. The document was made collaboratively using Google Docs – win for sharing and creating a great document. The new OS X El Capitan supports split screen view, so when I did the Google Hangout with the class I was able to have my crib sheet up on one side of the screen and the hangout window on the other #win – if you don’t have this feature you can always just resize the two windows you have open to fill the two sides of your screen. Split screen is a really handy way of working on two linked documents concurrently. Google Hangouts has a toolbox which enables you to do a variety of things. Thing one was that I gave myself a TV style banner at the bottom of the screen. The title said my ‘name’, “Professor Toothless” with the strap line of Dragon Expert. Hangouts also allows you to add some cool effects through face recognition and other technologies. So I gave myself a nice mortar board (I was a Professor after all), an eye-patch (I lost an eye to a Dragon once) and a moustache (although I already had one I thought it set me off quite nicely). I also used the green-screen tool to put myself on a beach in a setting that looked as if a Dragon might live there. I was set! The pupils were simply amazing. The impact of my visit upon the class was palpable. I spent 20 minutes answering their questions about Dragons, the answers of which are going to feed into their creative writing work across their forthcoming lessons. I wrote about the power of breaking down the classroom walls and bringing experts into the classroom in my Perfect ICT book. 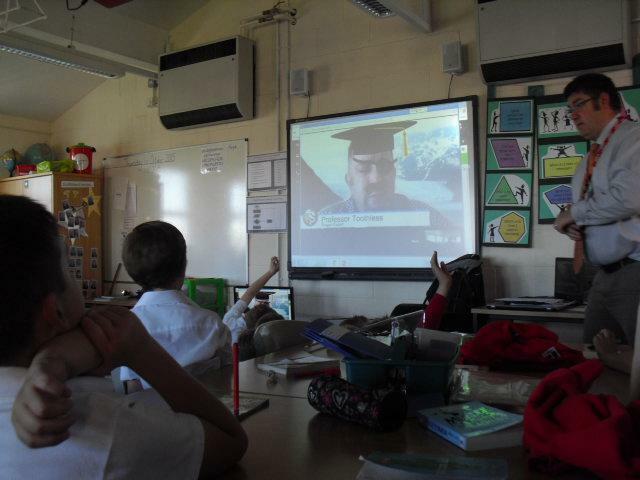 The case study I used in the book of Simon McLoughlin having Lord Jim Knight Skype in to his class had a massive impact upon the learning of the children and the experience that they had. This was the thinking behind this and Colin was clearly pleased with the impact, as were other members of his school community who came to observe the session. So what’s the point of this post? I guess I’m trying to make a few points really. Don’t be afraid to embrace technology – it doesn’t have to be bells and whistles. Having a go is massively important and if you don’t have a go, you’ll never know the impact it can have. See point 1. It doesn’t have to be bells and whistles in order for it to be impactful, enhance learning or be purposeful. Effective use of technology to enhance the learning experience can be fun and easy to achieve. Technology isn’t a gimmick – just think carefully about your intentions and reasons for doing so. Will it bring anything extra to the learning? My experience of working with these two schools is that the children go home learning lots and keen to tell their parents about what they did that day. I don’t know about you, but when my children get home, they all too often struggle to remember what they’ve done there all day. For me, I want children to go home loving their experiences of the day so much they want to shout about them and then can’t wait to go back in the next day for even more learning. I hope you’ve enjoyed these thoughts and would love to hear what you think in the comments. Please find the e-safety presentation shared below for you to use. If you do use them, please observe the correct accreditation as with all things on my blog, they are subject to a Creative Commons license and I would ask you to respect that. Thanks! If you’d like to work with me, then please do not hesitate to get in touch. I am available to work with your school too in a variety of different ways. More information can be found on my ‘work with Mark’ page here. Testimonies of my work are widely available too.